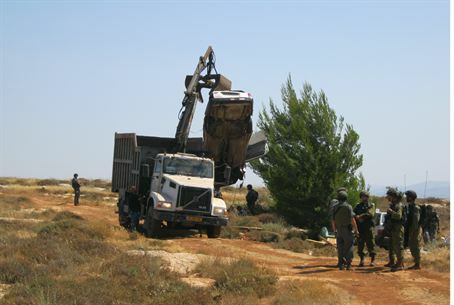 Security forces tore down structures at Gal Yosef, near Adei Ad. MK Ben Ari says Netanyahu and Barak are "obsessed." Security forces raided a small outpost community in Samaria Sunday night, destroyed structures and evicted residents. The demolished community is named Gal Yosef Hill and is situated next to Adei Ad, in the Shilo Bloc of the Binyamin region. Last week, the IDF issued an administrative distancing order against a resident of Gal Yosef. MK Michael Ben Ari reacted to the news by saying that "the destruction of structures tonight at Gal Yosef is part of the obsession that has afflicted [Defense Minister Ehud] Barak and [Prime Minister Binyamin] Netanyahu, which pits them against pioneers who settle the Land. If the rule of law is important to them, why do they not lift a finger against the illegal construction by Arabs?" Gal Yosef was established in 2009 and named after Gideon Lichterman, who was murdered nearby in 2003, and Yosef Haim Shuker, who founded the Meshek Achia farm. It includes several residential structures, greenhouses and a water hole.